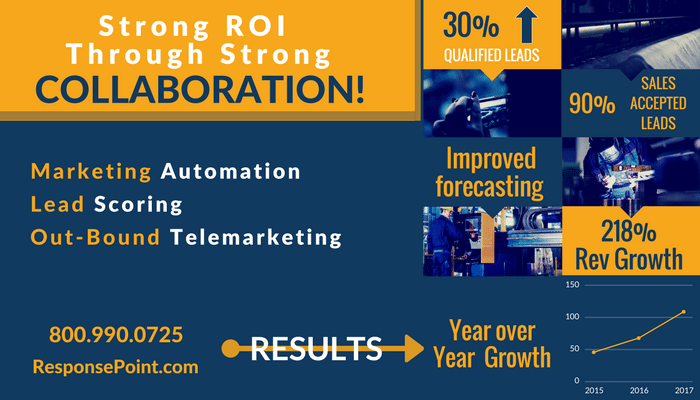 A large-scale global company with the mission of transforming energy management and automation in both residential and business environments came to ResponsePoint with a few pain points around lead generation, and we collaborated with the client’s team to create a more efficient, effective b2b lead generation process—with a bigger ROI. Like so many companies we’ve encountered, the marketing and sales teams do not enjoy an optimal partnership. The marketing team was generating a lot of leads and passing them directly to sales. Unfortunately, a track record of getting unqualified leads from marketing caused sales to let most of those leads fall by the wayside. The client needed a way to open communication between the teams, build trust, and create a healthier collaboration. Without any sort of standardization in the lead generation process, qualified leads were more often not fully qualified, and the lead nurturing aspect was also in need of improvement. Multiple conflicting processes needed to be combined into a single powerful marketing and sales process. Where once our client had internal resources for outbound calling, they had recently lost that capability due to marketing budget restraint. Without telemarketing lead generation and lead nurturing, the number of unqualified leads increased, causing a stagnant lead process. The ResponsePoint team began a partnership, providing an outbound telemarketing lead generation team that reached out to the client’s list of potential leads. Without the overhead of internal employees, this outsourced solution provided the flexibility and scalability that helped the lead process by leaps and bounds—without breaking the budget. Improve poor response time for leads, whether from an organic online form or one filled out at trade show. Provide a cost-effective method of outbound calling to create more qualified leads. Refine, develop and build a fully integrated lead process that merged ResponsePoint’s capabilities with our client’s marketing and sales platform. ResponsePoint was able to identify more qualified leads, garner the most useful information about each one, then send those leads to sales for closing. As a result, the lead-generation process was greatly improved, trust was restored between sales and marketing, and revenue has seen a major boost. What started as tactical outbound calling from a company list has grown into a key part of the lead-qualification process using with ResponsePoint even leveraging the client’s internal customer relationship management tools. The collaboration has allowed us to become a vital extension of the client’s team, giving them a deep look into the source of the internal challenges and facilitating solutions that created positive momentum. Additionally, ResponsePoint’s results helped open communication between sales and marketing, creating a smoother flow of leads, increasing trust that the leads were viable, and resulting in a more predictable forecast, a faster pipeline, and more closes. Want to chat about how to make your lead-generation program bigger and better? Schedule a brief call with the ResponsePoint team of lead-gen experts, and we’ll get you pointed in the right direction. Within the last year, there has been a 30% increase in qualified opportunities coming through the pipeline—leads that are much more likely to convert to actual sales. In 2015, the client achieved $45 million in marketing-generated orders. In 2016 it rose to $67 million. With 118% growth rate over the past 3 years leading to $100 million plus in revenue for 2017 with similar growth projections for 2018. A restructured process allowed for a 360-degree view of marketing operations, connecting the teams and forming a much smoother operation. Reliable Forecasting: With the help of the ResponsePoint telemarketing team, the client is now mining third-party data resources, identifying $100 million in NEW pipeline opportunities thus far in 2018. Improved Pipeline: Pipeline stagnation is almost nonexistent; it went from 60% cold leads to 18% hot leads. Accelerated Pipeline: Follow-up time on leads has decreased from days and weeks to mere hours. Improved Collaboration: The alignment between marketing and sales has greatly improved, with more collaboration and trust, a smoother process, and a better flow of leads. When you partner with ResponsePoint to create or improve your lead-generation process, we become an extension of your team, allowing us to create a more customized lead-generation solution. This approach optimizes your current process, allowing for increased efficiency, improved communication between departments, and a bigger ROI for your business. Want to chat about how to make your lead-generation program bigger and better? Get in touch with the experts at ResponsePoint and give your ROI and b2b marketing lead generation a big boost.